Eco Investor is ceasing coverage of Southern Crown Resources as the company is exiting its rare earth exploration activities. Southern Crown Resources has accepted an offer from the original vendors of Rare Earth International (REI) to acquire REI and all of the company's rare earth projects including the Nkombwa Project in Zambia and the Xiluvo Project in Mozambique. The agreement will be put to shareholders in late May. APA Group has extended the close of its takeover offer for Hastings Diversified Utilities Fund by a month to 31 May. It is the second time the offer has been extended. However, acceptances appear to be few with no recent updates on changes to its holding. APA has restructured itself and appointed additional executives to its senior leadership team. Following the reorganization, APA has three core business divisions: Transmission that operates APAs gas pipelines and storage facilities; Networks that operates APAs investments in natural gas distribution networks; and Strategy and Development to develop and operate complementary and new energy assets. Two new divisions will oversee APAs capital works: Infrastructure Development is responsible for engineering services and infrastructure expansion projects; and Strategic Projects manages major capital works projects such as the Mondarra Gas Storage Facility expansion and the Diamantina Power Station development. The Finance, Human Resources and Company Secretariat are unchanged. Managing director Mick McCormack said the new organisational structure brings together the revenue and cost sides of each core business and improves the companys ability to provide services and respond to customers. It also better aligns the business with our strategy, with a focus on our organic infrastructure expansion projects and complementary power generation investments, he said. Infigen Energy managing director Miles George has debunked what he says are three common misconceptions about renewables, and wind power in particular, that can affect the industrys social licence to operate. Yet this misconception has led to restrictive planning guidelines and regulations that have the potential to cripple the industry. Mr George said it is also untrue that the variable nature of renewable energy requires new generation capacity from fossil fuel sources. Wind energy now comprises over 20 per cent of South Australias installed generation capacity and electricity production, and at times supplies over 50 percent of its electricity demand. All of this wind energy capacity was installed over the last decade but during that time no extra peaking capacity was commissioned for the purpose of supporting this deployment. Not one megawatt. The lights have not gone out, and electricity price movements have been largely similar to other states, he said. Clean TeQ Holdings expects to report a net operating profit before tax of between $0.75 million and $1.25 million for 2011-12. It did not forecast an after tax result, but said the pre-tax expectation follows a significant loss in the previous corresponding period. This was a loss of $6.9 million. Executive chairman Greg Toll said the company is now focused on taking its competitive range of technologies in the Air, Water and Mining sectors to the marketplace in partnerships with companies that have global market reach and/or delivery capabilities. So far this financial year, the Air and Water Divisions have been awarded $16 million in new contracts. Some will be completed this financial year and some next financial year. CO2 Group is expanding into Queensland with a carbon offsets project, and has gained access to an Australian Financial Services Licence. In Queensland it is partnering with Bundaberg Brewed Drinks, which brews the well known Bundaberg Ginger Beer, to develop a carbon offset project at Moura, 300 kilometres west of Bundaberg. The project will allow Bundaberg Brewed Drinks to reduce its carbon footprint, and is being developed with the support of the Queensland Department of Employment, Economic Development and Innovation (DEEDI), which has provided advice and resources including seed from elite provenances. The project will also be used as a resource for research and development activities. Chief executive officer Andrew Grant said This is an excellent opportunity for CO2 Group as it allows for the ongoing diversification of the range of forest carbon projects that we are offering and the range of landscapes over which we can offer them. Its particularly positive for us because it means we are now operating on-the-ground in Queensland, a state that offers enormous potential for carbon projects across a broad range of industries. CO2 Groups access to an Australian Financial Services Licence is through it becoming a corporate authorised representative of Valuestream Investment Management Limited, which provides independent responsible entity and trustee services to fund managers in Australia. The licence means CO2 can deal in derivatives in Australias carbon trading markets. New legislation passed last year classifies emissions units or carbon credits as financial products, and from 1 July trading in the derivatives of carbon credits or the provision of financial advice on investment in carbon projects requires an Australian Financial Services Licence. CO2 said the licence enhances its capacity to provide carbon management services and enables it and its subsidiary, Carbon Banc Ltd, to provide investment advice and carbon trading services to companies. When its methodology is approved, CO2 Group will be able to create Carbon Farming Initiative (CFI) credits through its tree planting projects and the licence will allow it to trade these credits in Australias carbon markets. Mr Grant said This Agreement will enable CO2 Group to enter into forward contracts for the purchase or sale of Australian Carbon Credit Units (ACCUs) and other carbon instruments created under the Carbon Farming Initiative. Energy Developments has increased its corporate debt facility with a new commitment of $50 million through UBS. The facility is to pursue growth in the remote power and low emission energy sectors. Simon Henry has made an off market takeover offer for Hydromet Corporation after steadily increasing his holding. The offer is cash of 4.8 cents per share. There is no minimum acceptance level but there are some conditions, mainly about the company not changing its capital structure. Mr Henry is a professional investor and currently owns 24.86 per cent of the company. He said that Hydromets revenue has grown strongly, but its profit and dividend history has been volatile while total remuneration for directors has grown. Hydromet is considering the offer and recommends that shareholders take no action at this stage. Troubles continue at Clean Seas Tuna with the companys shares again falling to their recent all time low of 4.5 cents when it issued an update on operations and board changes. Director and former chief executive, Clifford Ashby, has resigned. The new director is Nick Burrows, a former senior executive and chief financial officer of Tassal aquaculture group, where he spent 21 years. The main trouble is ongoing heath issues with the Yellowtail Kingfish. A strategic review coordinated by recently appointed chief executive, Dr Craig Foster, with input from specialist external aquaculture consultants, is determining the cause and formulating a response. The gut enteritis health issue announced in February continues to lead to unacceptable mortality rates and poor growth. Losses of Kingfish juveniles to date are at 35 per cent and the rate of mortality has increased to three per cent per week. It is also affecting the profitability of the operation. The review is also looking at the tuna commercialization and propagation strategy. An interim report has confirmed that the Southern Bluefin Tuna propagation is encouraging. About 100 tuna are schooling and feeding well, with the weight of each juvenile over 100 grams. The company is exploring better ways of holding tuna onshore, including covering and maintaining a higher temperature in the pond to accelerate growth in anticipation of reasonable quantities of juveniles in 2013. Mission NewEnergy has received another letter from Nasdaq indicating that it is not in compliance with the minimum bid price of listed securities, US$1 per share. Po Valley Energy says a review of its reserves and resources by independent expert Fugro Robertson Limited confirms there is significant upside value in the company's portfolio. The company said that compared to the Reserves and Resources in the 2010 Annual Report, 2P (Proved and Probable) gas reserves are estimated to be 8.9 billion cubic feet (bcf) compared to 11.8 bcf in 2010. The decline is due in part to 1 bcf produced in 2011 and the previously announced expected decrease in reserves in the Castello field. 2C (best estimate of Contingent( gas is 44.1 bcf, more than double compared to 21.6 bcf in 2010, mainly attributable to the Canolo/Zini and Carola/Irma projects. 2C oil is 10 million barrels (mmbbls) contained in two onshore discoveries, Bagnolo in Piano and Ravizza. Overall the Proved Reserves have decreased slightly, due in part to Sillaro production in 2011. Estimated total 2C Contingent Resources of gas contained in the balance of our portfolio has increased significantly, with variations in individual fields. The increase is largely due to upgraded estimates of our Canolo/Zini and our offshore Carola/Irma projects. We now have two onshore oil discoveries with 2C estimate of 10 million barrels, said Giovanni Catalano, Po Valley Energy's chief executive. RedFlows successful IPO is over with the companys shares halving to a new low of 21 cents on news of a major restructure and that the loss for 2011-12 is likely to be between 105 and 120 per cent higher than in 2010-11. Based on a strategic review, RedFlow will focus on two activities: fast-tracking the outsourcing of its ZBM battery production and installing additional demonstration projects as forerunners to commercial sales in its target markets. But the company will significantly scale back its Brisbane operations to optimize productivity and minimize its cash burn. The outsourcing of component production and the extension of the demonstration phase will see local staff numbers reduced by just over 50 per cent. RedFlow recently entered the US market, which it says is larger than it anticipated. However it also found that each potential customer will undertake their own product trials before placing commercial orders. This will lead to slower growth in commercial sales than initially expected, and will absorb all of RedFlows production capacity over the next 12 to 24 months. RedFlow says these trials require a significant combined engineering effort from RedFlow and the customers. The level of available funds means the company will concentrate on a limited number of the most attractive opportunities. As part of the restructure, Phil Hutchings has resigned as chief executive and director. Founder and current chief technology officer, Chris Winter, has been appointed chief executive officer to implement the restructure. His remuneration as CEO will remain unchanged. The strategic review found that outsourcing commercial production must be accelerated, and that scaling up the non-automated Brisbane pilot production facility is less efficient and more costly. Scaled back production will meet demonstration phase needs, and reduce costly production errors which have been experienced. Meanwhile, the company will continue to develop its core Gen3 ZBM technology, and expand the Long Term Testing Program, including with third parties, to establish ZBM life and performance characteristics under a full range of conditions. * Deploy the first M-class containerized battery system to support a large solar PV array at the University of Queensland in Q2 2012. * Put in place an agreement to install a US or Asia based M-class demonstration project. * Commence testing the Gen3 ZBM prototype by the end of 2012. * Demonstrate long-term testing of over 1000 cycles from the ZBM by the end of 2012. In a bad sign for Refresh Group, bottled water consumption is slowing while opposition over its environmental credentials are growing. New data shows that fewer Australians are drinking bottled water. In 2007, 26 per cent of the population consumed bottled water compared to 23 per cent in 2011, according to the Roy Morgan Research Non-Alcoholic Drinks Survey, which also included soft drinks, juices, energy drinks, sports drinks and others. Some say the decline is due to local and international efforts to curb consumption for environmental reasons. Bottled water is banned in the NSW town of Bundanoon, the University of Canberra, the Southbank campus of the Victorian College of Arts and the Monte Sant Angelo Mercy College in Sydney. The largest declines were in the 25-34 year age group (36 per cent in 2007 to 29 per cent in 2011) and the 14-25 year age group (35 per cent down to 31 per cent). There were smaller declines in older age groups where there are fewer bottled water drinkers. Shares in Style have been suspended from trading pending an announcement about financing arrangements. In its December half report, the company said it had formalized a working capital loan for a minimum of $1.3 million. However, the contribution from an overseas lender has not been fulfilled, and the company is in the process of securing alternative financing. WestSide Corporation said gas production in March was 22.4 per cent higher than for the same period last year while March quarter production was up 10.6 per cent on the December quarter. March production was 305,019 GJ, up from 249,089 GJ in March 2011. 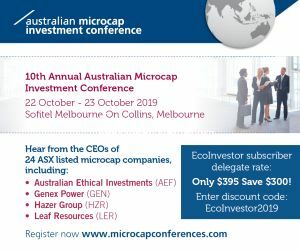 AnaeCo has finalized terms for the previously announced $10 million funding facility with an entity controlled by one of its directors, Dr Ian Campbell, and has commenced working on a $15 million capital raising. The $10 million facility is with CF2 Pty Ltd as trustee for the CF Trust (CF2). AnaeCo will initially draw down $3 million in $1 million lots, and can then request further draw downs until 30 June 2013. The proposed $15 million raising is by a placement to institutional and sophisticated investors. Corporate advisors have been engaged and due diligence has commenced. Under the Loan Agreement, CF2 will be required to submit a conversion notice for the first two draw downs plus the establishment fee on completion of the capital raising and convert this amount into shares. After the capital raising, any further draw downs may be repaid at any time or if a conversion notice is submitted by CF2 they will be converted into shares. Any principal amount outstanding by 30 June 2013 will automatically convert into shares in full satisfaction of the loan. The loan is a standby line of credit. Draw downs beyond the initial $3 million will largely depend on the success of the capital raising. If $15 million is raised, it is unlikely that the company will need to make further draw downs beyond the initial $3 million (and thereby issue more Shares to CF2 by way of conversion of the Loan), said AnaeCo. Managing director and chief executive officer, Patrick Kedemos, said the facility is a strong vote of confidence by Mr Campbell. Stanwell Corporation did not participate in Blue Energys recent share purchase plan and has been diluted from 12.09 to 7.67 per cent. Shares in BluGlass tripled from their all time low of 4.6 cents to 12.5 cents on two pieces of good news - technical progress, and a boost to its cash on a favourable tax ruling. The private tax ruling means BluGlass is eligible to seek a significant tax credit for research and development expenditure in its 51 per cent joint venture company, EpiBlu Technologies Pty Ltd.
EpiBlus deductible R&D expenditure for 2011-12 is forecast to be $5.5 million. The estimated cash return ranges from $2 million to $2.4 million and should be received in the August to October period as EpiBlu will lodge its tax return early in the new financial year. BluGlass is developing a Remote Plasma Chemical Vapour Deposition (RPCVD) based process to grow semiconductor materials for high efficiency LEDs and solar cells. EpiBlu is jointly owned with global semiconductor equipment company SPTS to bring RPCVD to market. The R&D Tax Credit cash will be directed to the remaining technical developments required to prove the commercial potential of the breakthrough technology as rapidly as possible, said BluGlass chief executive officer, Giles Bourne. On the technical side, BluGlass said it has produced high quality crystalline gallium nitride at low temperature on a commercial metal-organic vapour deposition GaN template. An independent expert report has confirmed a radical improvement in film quality. Earth Heat Resources has completed the first phase of the field program at its Copahue geothermal project in Argentina. Technology partners and potential equity partners were in attendance, and advisors are compiling summary reports that will provide input for refining project planning, cost estimates and development scheduling. Shares in Panax Geothermal fell to an all time low of 1.1 cent on 17 April. Papyrus Australia says the new factory in Egypt has been constructed and electricity and other infrastructure have been connected. The factory was built at the cost of partner, Egypt Banana Fibre Company (EBFC). It is 1,200 square metres on a 2000 square metre allotment. This is a significant milestone for Papyrus Egypt, said chairman Ted Byrt. We have now satisfied the Egyptian Governments development expectations when it granted Papyrus Egypt (PPYEg) the land in Sohag. EBFC has also lodged applications with the Egyptian Governments Social Development Fund (SDF) for soft loans totaling 6 million Egyptian Pounds; the funds will be contributed as capital to PPYEg for purchasing essential banana veneering and fibre production machinery from the Papyrus Australia subsidiary Australian Advanced Manufacturing Centre (AAMC). We have been informed by the SDF processing officers that the loan applications have satisfied all preliminary requirements and now the applications are being assessed by the SDF Board., he said. The 50 per cent owned Yellow Pallet BV joint venture in Holland is to commence the final phase of the feasibility study to design and build a banana fibre pallet production machine. Funding requirements are being negotiated and we expect the feasibility study to be fully funded by soft loans amounting to Euro 2 million from Dutch venture capital entities PPM OOST and the Dutch Green Technology Fund, said Mr Byrt.